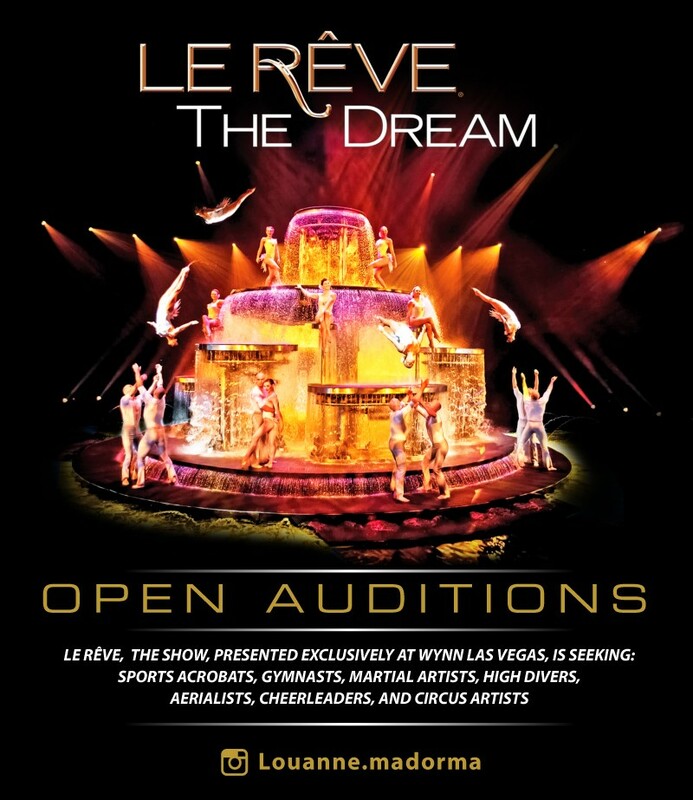 Le Reve the dream at Wynn Las Vegas is seeking a male acrobat/gymnast and a female acrobat/gymnast. Le Reve is a large scale aquatic spectacle in the round, and has been voted Best Show in Las Vegas for 8 consecutive years. We are looking for exceptional athletes and artists who have a passion for their craft and the desire to perform. *PLESE VISIT LEREVECASTING.COM FOR ALL DETAILS ABOUT THE AUDITION. (There are specific strength requirements, choreography, and swim tests that are a requirement for performers of Le Reve. These will be tested at the audition.) THIS AUDITION IS FOR ACROBATS/GYMNASTS. WE WILL BE AUDITIONING DANCERS AT A LATER DATE. THIS IS AN AQUATIC SHOW PLEASE BRING A SWIM SUIT INCASE YOU ARE ASKED TO SWIM ON A CALL BACK DAY.